No need to be a Web designer! Can you use Microsoft Word? Send an email? Then you can easily manage your website content! It's the smart way to market your business! Built-in tools help you integrate your site with Twitter, Facebook, YouTube, LinkedIn, and more! 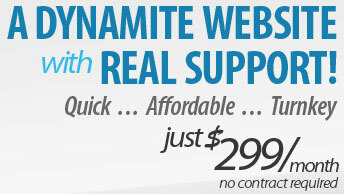 See how your website's performing instantly! Integrated Google Analytics gives you the stats on who's visiting, from where - and other vital data! Choose from a range of our award-winning design team's business-oriented website templates! Then we'll add personal touches just for you! Your site can grow as your business grows! We let you add all the pages you need - with full layout capability, too! Get found online! Our Search Engine Optimization tools and instruction ensure that you'll be seen by those looking for what you offer! You'll get the answers you need from our expert, U.S.-based support team - via phone, email, online chat, portal training, videos, and more! Through documents, videos, and hands-on education, we make sure you know exactly how to use our SBS tools to succeed online! New program from Cirrus ABS to debut at the 2010 Indiana Small Business Expo, November 18. More than just a small business website design firm, Cirrus ABS releases web enabled interactive Kiosk application. Boosting traffic after optimizing conversion will result in increased revenue and a happy bottom line. Then merchandizing will naturally follow. The Fastest, Easiest, Most Cost-Efficient Way Ever to Web Success!